It's no fabrication; there's an autolathe/general fabricator with its own room, creatively called the Autolathe Room. If you don't believe us, go towards the northern parts of the station and stop when you pass the Cargo Bay. If tools aren't your thing, there's also books and PDA cartridges from the vendors here. The APC for this room is on the north wall, on the other side of that empty locker. It's no fabrication; there's an autolathe/general fabricator with its own room in the starboard/south side of the station, creatively called the Autolathe Room. Except it is a fabrication, because it got tired of being in this cramped hellhole and moved to Tool Storage across the hall. 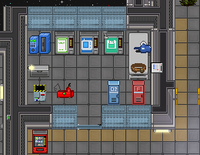 Now, the place is occupied by a PDA cartridge vending machine, ThinkDOS disk dispenser, and books machine, with a firebot and ABC-Unit as their tenants. There is no vent. Just a little mandate of the landlords. 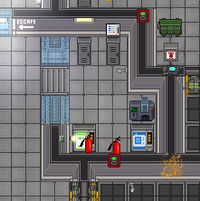 The APC for this room is on the right wall, over the table. This page was last modified on 1 October 2018, at 04:32.